You want to style your hair by giving volume or texture. But you don’t really know where to start finding the product suited for your hair and to get the look you want. Do you have this problem? Well, let us explain hair styling products by explaining difference in each type and which works the best for a particular look. There are many products to choose from: Gatsby, L’Oreal, Beardo and Parachute, etc. Before clicking that button, read the below and see if it works for you. 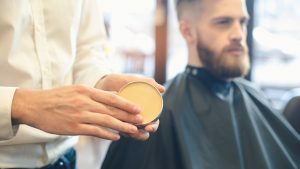 We will list our top 10 choices for Men’s hair styling products. Let’s try to find that one that works the best for you! 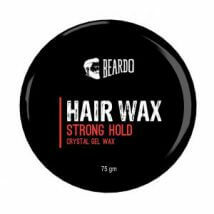 There are many ways to choose styling wax, your desired style, the length of your hair and your hair type. Knowing the basic tips on how to choose can avoid wasting money on products you might never touch more than once. When you say a hair styling product, you might imagine there is only one type. That is not the case. There are four basic types to hair them: “Fiber” type, “Cream” type, “Hair Cream” type and “Gel” type. There are different characteristics to each type. Let us look at the difference to see what fits you the best. Fiber type product is stringy, and this is why it keeps the style longer. And it melts well into your hair. And because of fiber, it creates a slick look. This type works for all types of hair length and style, whether you want to tame your curly hair or give a playful look to a short hair. If you haven’t tried any hair styling product, you might want to start with this type. The only caution is to keep the amount minimum. Over using it can make your hair look slimy and hard to work with. Not to mention it can get on your clothes. If you want to give a bit of volume without keeping the dry look, then this type works the best. “Cream” type does not hold your hair style as strong as the fiber type, so this work for people who wants to give a tad playfulness to the style. There is also “Clay wax” type of cream that gives matte texture. This type will accentuate the natural flow you already have. It is not to force your hair into a certain shape. So, it works best for men with longer hair. It will not hold your short hair spiky, but could give a bit of texture. It won’t feel sticky on your hand, so if you dislike the thickness of wax and such, this might be good. If you want to go detail and keep the style with a wet look, gel type will do the job. It finishes with a bit of slick wet look but keeps the style very well. One thing to keep it mind is, gel type tends to react to moisture, because it is water-base. Therefore, the stiff spikes you created can go soft in rain. The key is to apply it after wax or to get a gel that contains grease as well. It is also important to keep in mind how firm/soft a particular product is. 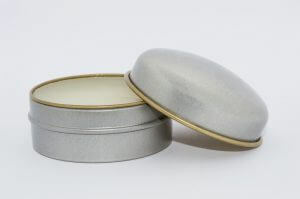 Hair cream usually has one consistency, but whether you are looking at a wax or a cream type product, there should be an indication of its firmness. Soft ones works great for men with longer hair with soft texture. It will not keep the style as strong as the hard type, but if you have medium to long length hair, you might want to work with the natural flow. Medium-Hard works well for all type unless you want to make your hair stand up like spikes. If you want to create a look that hold no matter what, choose the super-hard type. To many men, the finished texture is as important as the style itself. Some want to have a wet slick look, and some want to avoid that at all cost. 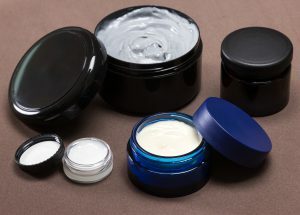 In general, if you want to avoid the wet look, you want to avoid gel type and choose wax or cream that indicates “matte”. However, all products act slightly different depending on the hair type. Make sure to read reviews before purchasing. So, here we go. 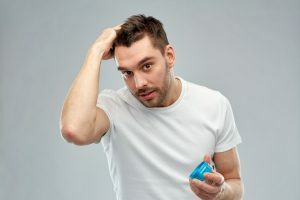 We are listing the top 10 hair styling products for men. These are chosen based on performance and popularity. Hope you are able to find the one works for your desired look. If you are looking for giving just a bit of texture to your hair while nourishing them, this is the product. It contains natural oils such as coconut and mineral to protect your hair. This product can give definition to your natural curls and shine your hair. However, if you want to keep a strong hold like keeping your spiky look firm, this will not be it. It is not sticky, so it also feels great while applying. If you are going for a natural look, then go for this! 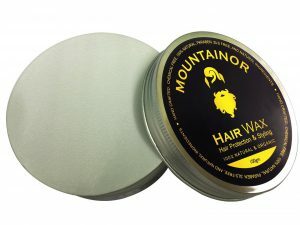 This product by Mountainor contains natural oils like almond and sunflower. It is not tasted on animals, so it is skin friendly as well. If you are looking for a hair product with strong hold to your style, this should be perfect. It works best for men with short to medium-short hair, and all hair types. It is strong enough to give a good stand on your hair if you have short hair. The smell is another great point about this product. It has a natural great fragrance. This might be perfect for someone who has sensitive skin but still wants your hair to stay in place. It is not the cheapest product out there, but worth investing! If you are looking for a hair product that gives a wet look as well as strong hold, this will do its job. 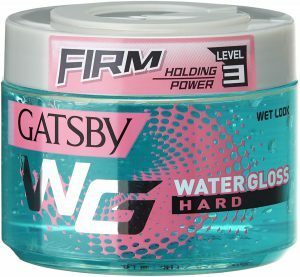 This product by Gatsby is a gel type and the strength is firm, which means it will hold your hair up to medium length. This is a water-based gel, so if it is raining outside, you might avoid getting your hair wet, and the style might lose its firmness after a while. And this has no fragrance, so if you want to put perfume, it will not crash with your desired scent. Application is easy and does not feel sticky. Once it is dried, which is pretty quick, your hair will stay in place with luster. 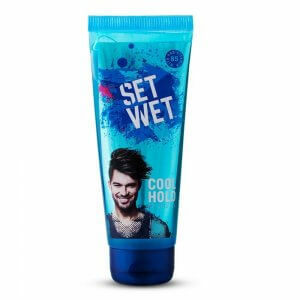 This hair product by Set Wet is great if you want your hair to have a playful light move to it. It works for short to medium hair. You can give a style without making it too stiff and crunchy. 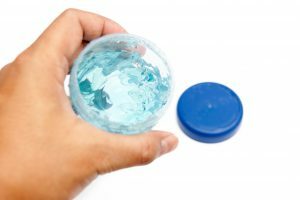 It is a light gel type, which means it is easy to apply and has a bit of shine. If you want to have a stiff strong hold, you might want to level up the firmness, which Set Wet offers. If you want to have a natural look using your natural flow of your hair, don’t apply it too much. It will give you a cool look and the best thing about this product is the price! Who can argue with this price! This product by L’Oreal gives a great control to your hair with a glossy look. Whether you have a very short hair to medium to even long hair, it works well. What is great about this product is it works well for thick stubborn hair as well. Depending on your hair length and desired hair style, you will want to apply different amount. If you don’t want your hair to move at all, stay in one place, then you might want to up the firmness. This is a fiber type, so you want to avoid double application. The price is not so cheap, but if you’ve had problems giving texture and flow to your stubborn hair, it is probably worth trying this product. 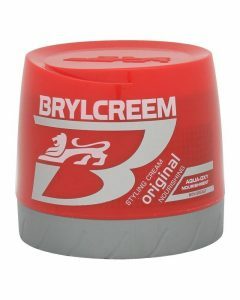 This is a cream typed product by Brylcreem which holds your desired style for a long time. It nourish your hair while giving a great look. The cream itself is pretty thick and might feel greasy at first. Try to apply modestly at first to see the right amount for your hair. More you apply the better hold, but more greasy it will look. The fragrance is on the heavy side as well. What’s great about this product is that strong does not mean hard on your hair. It keeps your hair shine and avoid brittleness often comes with firm hair product. If you are looking for a strong cream typed product without damaging your hair, try this one. If you have a short hair and want to have firm spikes, this will work great. 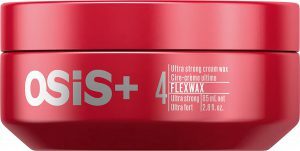 This product by Schwarzkopf is a wax typed hair styling product that holds a particular style for a long time. It can feel a bit thick and sticky at first. Before applying to your hair, warm it up using your finger tips. 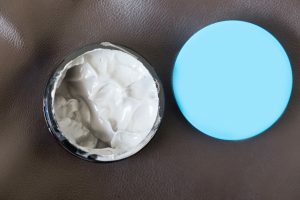 Because of the strong hold and because this is wax, it will not dry completely. If you are doing outside activities like going to a dusty place, it might get on your hair a bit. If you are going out at night, trying to keep your hair’s style while dancing, this will do the job. 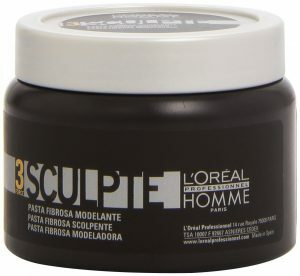 It works amazing for men with short to medium hair. If you have short to medium-short hair and give a shine, texture and a bit of style, this will do the job. This popular product by BEARDO is a thick wax type that gives a great shine to your hair. Depending on your hair texture and length, strength might differ. Though it does indicate Strong hold, if you have thick long hair, it will give a great shine, and it will accentuate your hair (or beard) naturally. In a sense, it is a versatile product. If you have a fine textured hair and does not want to try a product too expensive, try this one instead. It also has a nice woody fragrance that customers enjoy! 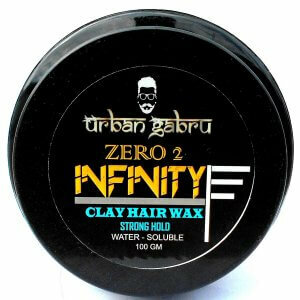 This product by Urban Gabru is a clay-type wax that offers great hold. It works best for fine to neutral hair texture and short to medium hair length. It contains natural ingredients like almond oil and clay, which can be good for your hair. This is a very popular product in India not only for the reasonable price and permanence but also its application. It is easy to apply to your hair, so works for beginners as well. If you are trying to get an undo hair style and want to keep it all day, this is great! And for beginners! Don’t be shy, try that spiky hair you always wanted to try! 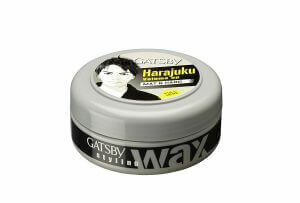 This style wax by Gatsby is one of the most popular hair products sold in India, and there is a reason. There are six different kinds of wax they offer, and you can choose one depending on what you are going for. If you want to have a firm hold with matte look, Mat and Hard does the job. And if you want a firm hold with shine, then Tough and Shine. Loose and Flow will go down a notch with firmness which means it will work well for men going for natural texture. Power and Spikes is for men who want to hold the style for a longer period. It is on the matte side. 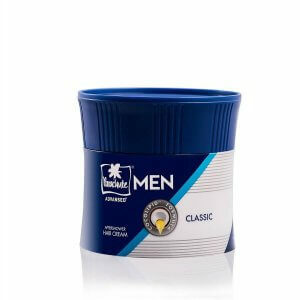 This styling wax works the best for men with short to medium hair. All in all, there is one for almost everybody, and for this price, you can even try more than one! For some men, application is the most intimidating aspect in trying to have a new look. So, here are some basic tips on how to apply hair styling products. The amount you start with is very important. If your hair is about your ear line, then take about the size of a coin to your hand. If your hair is shorter than that, try about the size of a bean. Next important thing is to sort of melt the product on your fingertips/hands. The great thing about wax and cream is that they work the best in your skin temperature. If you are using gel, then the speed is important. You don’t have to wait for it to melt. Squeeze on your hand and apply immediately. And don’t aim the root. Try to apply it from the mid part of your hair to the tip. And when you think you applied evenly around your hair, then start playing into the style you want. 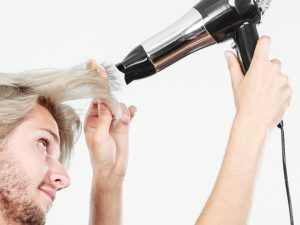 The best way to keep a good solid style that last long is to use a hair dryer. After wetting your hair, apply the hair product accordingly. Then, aiming the root of your hair, you dry it. This will create volume to your hair. To create firm volume, you rub your root of hair while blowing your hair against the natural hair flow. To have your hair stand firmly, like spikes, blow it closer to the root with hot air. If you want volume down your hair, then blow dry from above while holding your hair down. Some people have harder time making hair stand up. If this is your case, then use both cold and hot air alternately. If you are using gel, don’t use hot air. Cold air can stylize your hair well. How was it? Did you find the hair product you are looking for? Remember, playing with your hair or giving a bit of style to your hair isn’t just for women. Who said men cannot have fun with hair? There are many products out there, so before you click that button, don’t forget to keep in mind some of the tips here.